DIG is Guralp Systems’ firmware for Minimus and Minimus+ digitisers. Instructions for upgrading Minimus and Minimus+ digitisers can be found in Section 5.17 of the Minimus manual: MAN-MIN-0001. Backfill of a historical segment of samples is not supported - i.e. the SEEDLink server in dig v1.2 only supports live streaming of samples In addition to SEEDLink DATA commands, SEEDLink clients can ask for live streaming of samples using SEEDLink TIME commands with zero or one arguments. However, because SEEDLink TIME commands with two arguments are used to ask for a historical segment of samples, the second argument of these SEEDLink TIME commands are always ignored by the SEEDLink server in dig v1.2. In other words, SEEDLink TIME commands with two arguments are always treated as if they were SEEDLink TIME commands with only one argument. Dial-up mode is not supported. SeedLink FETCH commands are always rejected. The SeedLink server of dig v1.2 will only operate in “real-time” mode. The ‘!’ negation character in stream selectors is not supported. Negative stream selectors are always rejected. The SEEDLink server in dig v1.2 only accepts positive stream selectors. SeedLink handshaking in uni-station mode is not supported. IRIS states that “almost all connections are negotiated as multi-station, even if only a single station is requested; uni-station mode, for most publicly accessible servers is deprecated.” (Iris SeedLink Overview). Latency problems. The seedlink_samples_streamer thread polls for new samples instead of being event-driven. This software pattern is subobtimal, especially with regards to latency, but it was much quicker to implement as an initial version. Fix for a bug which could leave the Minimus unresponsive if it was not rebooted after a system crash. The SD filesystem-layout version-number has been moved to a different location so that SD cards can now be opened correctly in Windows 7. Note: Because of this change, a full-format of the SD cards is recommended after installing this upgrade. A centring button (actually, one-second mode) is now displayed when the sensor type is set to 40T. The Location and Channel codes for individual streams can now be edited from both the Data Stream and Data Record tabs. Note: Because of this change, the channel codes should be reprogrammed after installing this upgrade. QSCD 2D/3D PGA values corrected [Experimental v1.2-8622]. QSCD code can now be configured on a per-sensor basis (under "Network" tab) [Experimental v1.2-8622]. Causal channels of MEMS accelerometer seedName provided [Experimental v1.2-8622]. It is now possible to change channel names via the web page [Experimental v1.2-8619]. The "Station Code" is now editable on the "Setup" tab [Experimental v1.2-8619]. fix: Corrected the update of values of NVR variables with long names [Experimental v1.2-8618]. Bug fix: Bluetooth device name not being set up correctly [Experimental v1.2-8617]. Bug fix: Webpage login issue when authentication could not be unset [Experimental v1.2-8616]. FPGA reprogramming with custom binary send over file exchange protocol functionality added [Experimental v1.2-8616]. GüVü should now be able to see the Minimus. This version has new functionality, performance improvements and numerous bug-fixes. Note: This release changes the file-structure used on the SD cards. Please download any required data, verify the download and then full-format both SD cards after installing this update. The fixed SD card can be reformatted by removing the removable card before initiating a full format. System configuration reset due to a range-check on DNS entry issue fixed. Output data chain information tool-tip extended by sensitivity values (on web page). SEED names of mass position channels coded with 'M' character. GDI connection handling changes to improve network latency adjustment. Selective data download from SD card added. Bug fix: System cannot be rebooted remotely if configuration update is not finished. A problem affecting calibration values for Radian instruments has been fixed. 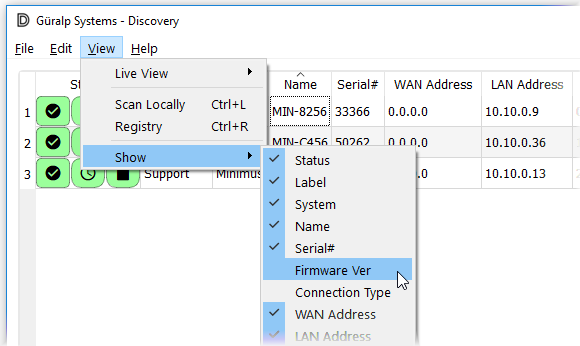 Installing this firmware is essential for the correct operation of the calibratiopn page editor in Discovery. A problem causing incorrect notifications about station moves has been fixed. A problem which resulted in no data for channel *Z0 has been fixed. GDI streams now have correct channel units metadata. Data Transforms have been introduced (including PGA/PGV/PGD calculation). The LED behaviour has changed: Rapid white blink (bootloader stage) ⇒ Solid white (OS initialisation) ⇒ Status mode (operational). Auxiliary files are now available on the "storage" webpage. Errors in DatalessSEED and RESP files have been corrected. SEED metadata is now generated only for seismic channels. A progress bar has been added for the "full-format" function for SD cards. A problem which caused corruption in SD files when multiple downloads were performed in the same time has been fixed. Download speeds for SD card files have been enhanced. HTTP ranges are now accepted for SD card files download. Seedlink backfill handling improved - including configurable backfill buffer size. Internal data transfer procedure enhanced. Minimus crash during remote console operations fixed. Several dataless SEED values corrected. Responder protocol extended by additional system state of health information. Manual relay control added to the "setup" webpage. Extra power saving when Minimus operates in "power save" mode. Fixed a bug where streams received in SCREAM! can get behind in (or ahead of) time by 80ms. SeedLink backfill requests based on packet sequence number are no longer rejected. However, please refer to the list of known limitations under Important notices to see what happens when backfill is requested by packet sequence number. SeedLink backfill time increased to cover 15 minutes. Usable RAM size increased to 220MB for better system stability. System image file pre-allocation added to prevent Minimus crashing during system update (after a long run). Bluetooth module application update (v0.1.0), and Bluetooth reliability improved. Every Minimus can now control (via the RS-232 signals of its Analogue connector) up to five ASE-OBS-x043 power supply boards, or one 8-channel I/O expander module. Many other improvements in system stability. Users can now execute the FPGA firmware update process via the “Setup” web page. Secondary Data Record taps are now available for a few decimation chains. Normal response for Radian sensors defaulted to 80 seconds, and FPGA integrator rescaled. MiniSEED files on microSD cards can now be downloaded from the new Storage web page. The fourth analogue sensor input – the X channel – is now visible. New feature – GDI auto-connections to remote hosts. The new “fastspi” datalink protocol has been implemented and is enabled by default – FPGA firmware version 3.11 or newer must be used with this dig release. The built-in copy of the FPGA firmware file has been upgraded to v3.11. More stable and robust Bluetooth connections – GüVü version 1.3 or older might fail to communicate with this dig release, because the Bluetooth protocol has changed. The U-Boot bootloader associated with this dig release has been updated to v2017.03-1, to fix the intermittent Ethernet TX timeout failures. More stable and robust GDI connections. Stability and speed improvements to “System Update”. Send and receive timeouts for sockets now work – lightweight IP in dig has been updated to v2.0.1. Very many other bugs have been fixed. The U-Boot bootloader associated with this dig release has been updated to v2017.01-1, to fix the intermittent initialization failures of external microSD cards. A bug with calvals.txt link not working was fixed. A few typos, wording inconsistencies and formatting inconsistencies have been fixed in RESP files. The network code in the dataless SEED file is no longer hardcoded to GU. Prevent dig from crashing whenever users click on the button in the Data Flow web page. The built-in copy of the FPGA firmware file has been downgraded from v2.10 to v2.1, because FPGAs running firmware v2.10 do not lock/sync their main clock correctly. Minimuses should no longer encounter the “stuck at RomBOOT” issue. The Minimus’ status.txt file is now sent to Seedlink clients every 5 minutes by default, via the new SeedLink SOH channel. SEED locations are now configurable, as requested by OGS.